OK, this game is in Portuguese, but I think anyone can figure out how to play it. What you more or less have to do is: Buy troops for your army. Upgrade them with inventory items. Take to the field against the opposing army. Win the battle and recruit more troops and upgrade your army. Click on 'Campanha' to start a campaign game. 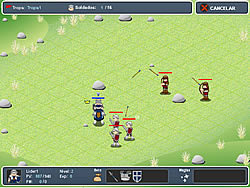 Click on 'Batalha' for a quick battle game.